While there is no company in existence today known by the name Standard Health Insurance, there is a company by the name of Standard Life and Accident Insurance or Standard Life as it is widely known. Standard Life is a subsidiary of the American National family of companies. It specializes in insurance and annuities for seniors. Insurance products include both life and health insurance. Compare health insurance rates from Standard Life with those from other companies. Click here and enter your zip code to begin comparing health insurance rates now. Standard Life has been in business for over 50 years. Today they are one of the top insurance providers for the senior population. In 2010, the company’s net assets totaled $513 million, liabilities totaled $290 million, and their capital and surplus funds totaled $223 million. These numbers support their claims of being a financially stable and secure company for which you can feel comfortable investing. 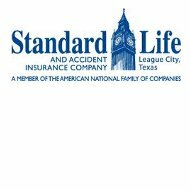 Standard Life and Accident Insurance is headquartered, along with its parent company, American National, in Galveston, Texas. If you would like to contact the company for more information, you can do so via phone or mail. You can also complete the online contact form to have a customer service representative contact you. Standard Life receives solid ratings for financial strength and security. Based on these ratings you should be able to feel confident that the company is stable and not facing bankruptcy any time soon. Both well-known ratings companies, AM Best and Standard and Poor’s, give Standard Life high marks. Additionally, although the Better Business Bureau does not rate Standard Life itself, its parent company, American National, has received an A+ rating by the BBB www.bbb.org , for the length of time it has been in business, complaint volume compared to other businesses of its size, and rapid response to any complaints. Compare rate quotes from health insurance companies in your area. Simply click here and enter your zip code to begin comparing rate quotes. I have cancelled my policy with you about a month ago after reviewing it. I did not have the policy for a month and was told that if I returned it within 30 days I would get a refund of what I had paid, which by the way was taken from my bank account. I no longer have that account as it is now closed, But I would like my refund of 129.00 dollars sent to me. I have had this health insurance for over a year. I have had a surgery and several doctor visits. It is the best I have had in my life at the age of 54. It is also very affordable. I thank goodness for their coverage! My whole family is now on their health plans. This was the first insurance I have had since Medicaid and I am very disappointed. I was unsure to get it I the first place. so I asked if they would send me the info via email and was told yes.however after several days and not receiving an email I called back and was told they do not do emailing they prefer old style and send it in the mail. strike one. when I finally received the info in the mail a few WEEKS later. I was unhappy and decided to cancel. I called for weeks could never get through to anyone. the automated system tells you to leave a message and your call will be returned in 24hours. however, the couple times I left messages they were never returned.I finally was able to get in touch with someone to cancel my policy and she says someone will call me back shortly to confirm my cancellation. however, the 2nd months payment was withdrawn the same night. I didn’t receive the confirmation call until a day or two later after it was already withdrawn. so, I had to call 3or4different numbers and explain my problem to get a refund..however I was unable to get the first months guarantee refund bc I didn’t completely cancel until after the second month was already withdrawn. they only sent me 166.32 for the second month instead of the full 206.00 that was taken out of my account…..and now two months later I realize I’m still being charged 10.55 a month for the life insurance part because I wasn’t told I needed to call yet another number to cancel that. I ended up paying 268.78 for 30days of insurance I never used. thank you, I would not recommend this company to anyone.